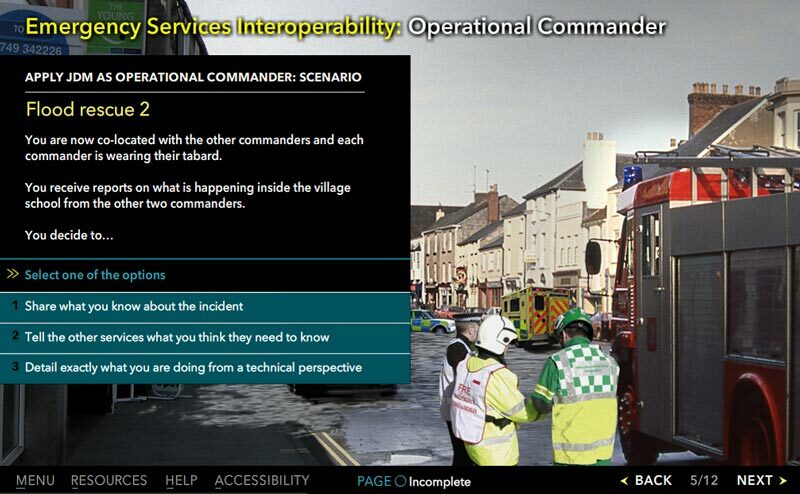 The Emergency Services Interoperability Commander e-learning package is aimed at those who would take on either an Operational or Tactical role when responding to an incident from the police, fire & rescue, ambulance service or other responder agency. It does not matter what rank or position you hold. The package will take about 65 minutes to complete. They do not replace attendance on the one day commander training courses and can be used as general awarenss, prior to attending a training course or as refresher training. The packages contain a scenario which will present different challenges depending on your role. You will learn about the five principles for joint working and how to apply the Joint Decision Model to achieve the primary aim of any emergency response to save lives and reduce harm. 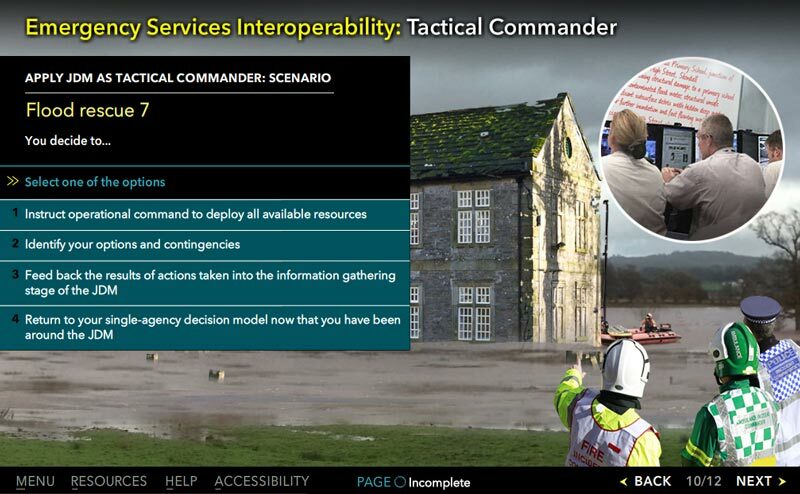 Police services access the package via their Managed Learning Environment (MLE). Fire & rescue, ambulance services and other responders will access the package directly via the links above. There are knowledge checks in most chapters so if you do get the answers wrong, you’ll understand why and supporting documents are available in the Resources section. Please be aware there is some overlap with the All Staff E-learning package. Completion of this package will count towards Continuing Professional Development (CPD) and once completed you should either print the CPD certificate or save it as a PDF file which can then be stored electronically or emailed. Please note you can only print the completion certificate if you are connected to a printer at the time. Unfortunately, there is no way to go back and print a completion certificate at a later time. For staff in fire and rescue, ambulance services or other responder agencies, you may want to follow local proceudres for recording CPD which may include sending a copy of your certificate to your local HR or Learning & Development department.